I know you've heard me talk a lot about the demonic weenie dogs that call children. But here is my favorite picture I've ever taken of them. The only one in fact where they have ever actually sat in the same place and looked at the camera at the same time. 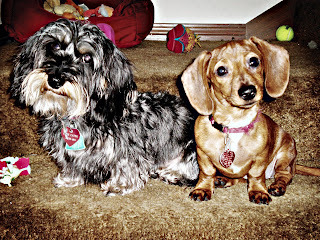 Ellie is the soft-wire hair on the left and Maddie is the plain ole red daschund on the right. They have the funniest personalities I have ever seen in dogs. Ellie got upset about the rain the other night and insisted she get in bed with us. If Maddie sees you pick up anything larger than a purse she assumes we are going to Vidalia. Maddie loves listening to Jer play guitar, Ellie would rather be alone on her chair than associate with the rest of humanity. Ellie also use to love walking...now she would rather have her legs cut off, where Maddie would walk around the block till her legs fell off. Ellie Poo is fearless and knows the world revolves around her, and on the other hand Maddie is a huge chicken who is scared of cats. Ellie will let you bathe her, trim her nails, and cut her hair like it's nothing. Maddie on the other hand is like bathing and trimming a wild monkey with rabies.